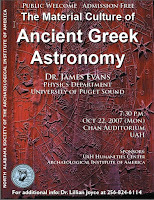 Dr. James Evans of the Physics Department and director of the Science, Technology, and Society Program of the University of Puget Sound will give a talk to the North Alabama Chapter of the AIA on "The Material Culture of Ancient Greek Astronomy." The talk will be 22 October at 7:30 PM in Chan Auditorium. He is associate editor of the Journal for the History of Astronomy and the author of The Theory and Practice of Ancient Astronomy (Oxford University Press, 1998) which covers the field from Babylon to the Scientific Revolution. Please come and bring a friend.